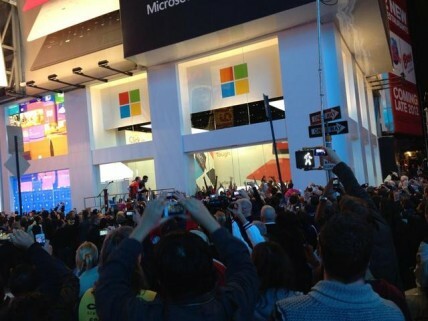 Last night Microsoft threw a huge party in Times Square, New York to celebrate a whole host of new products – Windows 8, Windows Phone 8, and the Surface tablet. Windows 8 and it’s Metro/Modern UI is the biggest change to Windows in over a decade with a new focus on touch devices, and an interface that is unified across laptops, tablets, and smartphones. The new OS is make or break time for Microsoft, a company built on the shoulders of the most ubiquitous operating system in the world for PCs and laptops, but also a company with barely a toe-hold in the operating system competition in the smartphone and tablet space dominated by Apple’s iOS and Google’s free and open source Android. As we move further into this post-PC world, Microsoft needs to be competitive in the tablet and smartphone markets – and Windows 8 and Windows Phone 8 are their plays. The first tests of Windows 8 are in, and people are commenting on speed performance pretty equal to Windows 7 in most cases, and Windows 7 is pretty nippy itself, but in certain games and especially boot up times – Windows 8 vastly outperformed its predecessor. Speed is therefore not an issue. What could be much more of an issue is the design. It is a continuation of the Metro UI found on Windows Phone 7, and I personally find it dynamic, easy to use and easier on the eye, but people hate change. Windows has looked basically the same since XP and that was released eleven years ago. That is a long time, and Windows 7 just does not work well with touch devices, but the Metro/Modern UI of Windows 8 does. Moreover, you can use a desktop much like that found in Windows 7 if you so desire, so you would think people would be quite happy with the new options – but the press have reported the change as if the sky is falling in. It’s not a straight-up icons based UI like iOS and Android? Scary. To be honest, if you already have a laptop running Windows 7 I don;t see much reason to upgrade, at least for the time being, but if you’re buying a new laptop now – there is no reason not to choose one with Windows 8.